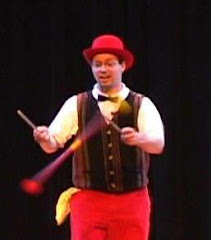 Had a couple of shows for Hill Country libraries this week ... at which I mentioned plate spinning as a great, easy, introductory trick. But you want to get some special spinning plates, and here are some places where you can do that. I'm not affiliated with any of these retailers ... I just did a search and posted some likely-looking links. The Mansion Athletics one promices a $5-something price, which is better than I've seen elsewhere. If you're in Austin, I believe you can find these at Terra Toys and Toy Joy.